The good news is that Hungary is still a democracy, flawed but still democratic. Free and fair elections are due on April 8. This is not Russia. Prime Minister Viktor Orban is no Vladimir Putin and overt repression is not his thing. The governing Fidesz Party, in power since 2010, will likely be returned to power due to a weak and disorganized opposition and an electoral system that advantages the large parties. Hoping to finally put Hungary on the right side of history, Mr. Orban has closed the door on Western-style liberal democracy. Since the Hungarians always put a unique stamp on everything they do, authoritarianism with Hungarian characteristics is more fitting. Launching a system called national co-operation, based on traditional values of work, family, nationalism plus Christianity, the government is anti-pluralist, creating a place of people either with or against them. Fidesz has changed Hungary with breathtaking speed. Some of the changes have been good. The economy is stable, the government sent the IMF advisers home and saved hundreds of thousands of people from bankruptcy. Foreign direct investment is on the rise, unemployment is down and more taxes are being paid. Budapest has never looked better. Opponents say the government is nothing more than a family business enriching themselves with cash skimmed off from European Union funds for infrastructure projects. Mr. Orban embraced some of the worst tendencies of the 20th century and turned them into weapons against often fabricated opponents. For Mr. Orban, big lies and the creation of incessant crisis are the keys to power. It’s a kind of lowbrow Orwellian state in the making. Hungary's Prime Minister Viktor Orban looks up during a plenary session at the European Parliament in Brussels on April 26, 2017. Armed with a two-thirds majority in parliament after the 2010 and 2014 elections, Fidesz has essentially governed Hungary without any opposition. 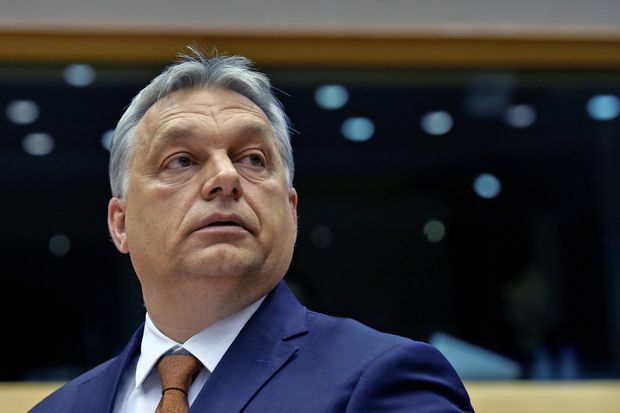 After the revolutionary changes in the first term, the start of the second term suggested that Mr. Orban lacked new ideas. The migrant/refugee crisis in 2015 changed him, Hungary and Europe. As hundreds of thousands of people transited through Hungary, Mr. Orban moved to build a fence to control the southern border. First criticized for the act, the Prime Minister was later lauded and others followed. He said no to resettlement quotas, no to diktats from Brussels and no to liberal-inspired political correctness. Many European leaders praised his decisiveness. Hungary is a sovereign country, free to decide its own immigration policy. There is no point to moralize about it or remind the Hungarians of the ultimately different world response to them when they fled in the thousands after the failed 1956 revolution. But where Fidesz can be criticized, within the context of the values that are at the heart of the EU project, is for the methods they use to mobilize support. In 2016, the government launched a referendum on shutting the door on refugees. Even when armed with biased questions, the referendum did not reach a required 50-per-cent voter turnout to validate the outcome. Regardless, citing that almost everyone who voted opposed refugee or migrant resettlement, the government declared a victory. The referendum was followed by a number of taxpayer-funded campaigns and national consultations. The latter usually asked a series of leading or even misleading questions designed to validate existing policies. Knowing the Hungarians generally support the EU, Mr. Orban is careful to wage his wars on a faceless Brussels and not the EU. More worrying were the primitive campaigns against the Hungarian-American billionaire philanthropist George Soros. So far, we have witnessed three very costly campaigns against Mr. Soros and his “global networks.” Running the present election campaign on essentially a single issue – Muslim migrants – Mr. Orban asked Hungarians to believe that Mr. Soros and his allies in Soros-funded NGOs have a master plan to flood Hungary (and Europe) with refugees. Moreover, Mr. Orban’s government used some shady methods to almost shut down the Central European University in Budapest founded by Mr. Soros. Arguably the best university in the region, the tiny CEU seems emblematic of Mr. Orban’s quest for enemies and crisis. As it stands now, CEU hangs in limbo with people saying its fate will be decided by the election. It’s never a good sign when universities depend on election outcomes. In March, Mr. Orban gave a speech on the occasion of a national holiday. He sounded a lot like Slobodan Milosevic when he roused the Serbs in 1989 in Kosovo. Mr. Orban spoke in dark and apocalyptic terms: people were trying to take their country from them and hand it over to foreigners. Western Europe was being lost city by city to strangers. Betting that security from foreigners is what most people want, Mr. Orban sees himself as Hungary’s (and Europe’s) saviour. Hungarians, Mr. Orban argues, need to vote for him or simply slide into oblivion. Mr. Orban offers an idyllic endless present. It may be hard to say no to that.